With just one year to go until Ocean Cay MSC Marine Reserve will receive its first guests, MSC Cruises marked an important milestone in the island’s transformation with the planting of the first trees. After visiting the island to personally plant one of the inaugural trees, reflecting the island having entered into the final phase of its transformation, MSC Cruises executive chairman, Pierfrancesco Vago, commented: “It was a very special moment to be on the island together with the team that has been working non-stop on this incredible project to see how our vision is starting to take shape. “Words cannot convey the unbelievable natural beauty of our island and it is only when you have stood there for yourself, surrounded by nothing but beautiful ocean with nothing else on the horizon, that you can really understand what we are accomplishing here. With the landscaping work underway, over 75,000 native shrubs and plants will be planted with more than 60 types of indigenous Caribbean trees, grasses, flowers and shrubs to create a lush, tropical environment. Work will commence soon on over 100 environmentally-friendly structures, which will include bars, restaurants and housing for employees and staff who will live on the island. Work will also shortly be underway on the lighthouse – set to become an iconic landmark of the island and a focal point of the evening’s entertainment for guests. Vago continued: “We are already seeing the return of the marine life that is usually so prevalent in this area. “We are seeing an abundance of lobster, conch, stingrays and other fish and by the time we finish the work the waters around the island will be again teeming with life and new coral. During the island’s clean-up, over 500 tons of historic industrial waste and scrap metal have been removed, with the final underwater debris clean-up about to begin. 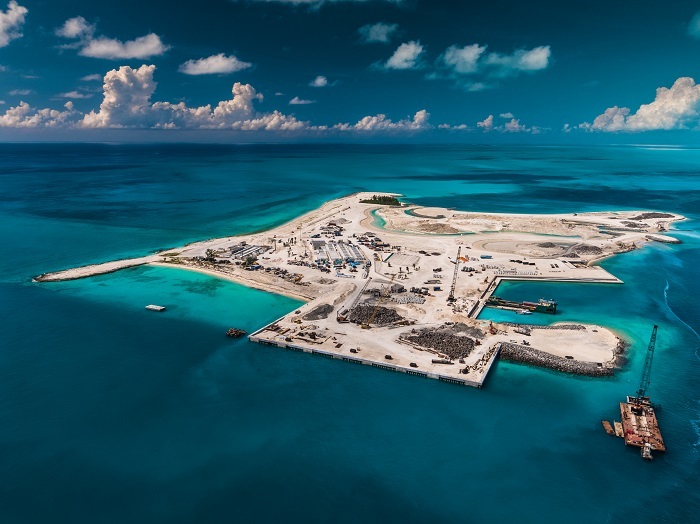 To create a solid foundation, over 500,000 tonnes of sand and soil have been moved and work has been carried out to shape the island itself. A shallow water lagoon will be created in the centre of the island to provide a fun area for families to relax and while away the day.